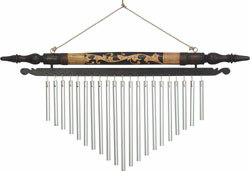 We have a wonderful collection of windchimes for you to choose from! Our windchimes can be hung inside or outside. WINDCHIME - BAMBOO FIREBURNED - 23"
This windchime has a coconut top and painted bamboo chimes, that produce a soft sound. Handcrafted in Bali. Woodburned design may vary. WINDCHIME - BAMBOO COCONUT BALL - 26"
This windchime has a coconut top and painted bamboo chimes, that produce a soft sound. Handcrafted in Bali. 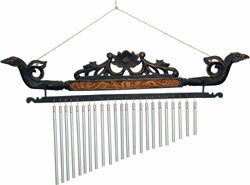 This double row Bamboo chime has a little sun painted on each chime. Handcrafted in Bali.